Optical Disks need converting? 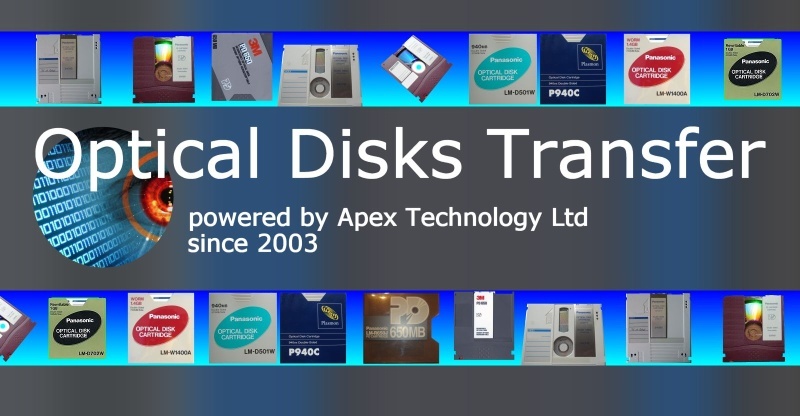 Our friendly team is happy to help transfer your Panasonic LM Optical Disks Cartridges and Plasmon P Optical disks. We can even read disks when the file-system is unknown, and reverse engineer filesystems to extract files. Data Recovery and File Extraction can be undertaken on WORM Write Once and ReWritable discs. We also recover data from Optical Disk Library auto-changer and jukebox certified disks. Below are common model numbers we see, however just contact us if your discs are not listed. Disk capacities were 200MB single sided, 470MB/Side, 500MB/Side 700MB/Side 750MB/Side 200MB 470MB 650MB 940MB 1.4GB 1.0GB 1.5GB, 940 MBytes, and were available as WORM (Write Once) , ReWritable. The disks were commonly used in Magstore, Storage Dimensions, Reflection Systems, Corel PRO Drive, and IBM 3363 WORM	Write Once Optical Disk Cartridge, MAXIMUM Duetie, Bio-Logic, and usually appear as DOS, Windows, Novell and Apple Macintosh filesystem drives - even though in reality the raw data on the disk is encoded and won't mount normally. They have been used in a variety of medical CT, PET, MRI scanners, document scanning systems, document management system, electronic filing cabinets, disk library, jukebox often using encoded filesystems meaning they appear corrupt / faulty or won't read or mount under Windows / Dos / Unix without special decoding. Fortunately for you, extracting the files is not a problem for us! These optical disks are sometimes mistaken for Magneto Optical disks or MO disk, however they are not the same. LM-R1400A, LM-W1400A, LM-R1500A, LM-D500, LM-D500W, LM-D501, LM-D501W, LM-D702 ,LM-D702W. The discs were available as WORM and Rewriteable. They were used in Panasonic LF-J5000 LF-7000 jukebox disk library, with interfaces to Mac, Vax VMS, Unix, Xenix, and Micro Channel and Plasmon RF Reflection Jukebox. The WORM discs are Write Once cartridges and are often used as backup archive as the data cannot be overwritten. The WORM effect is managed by software ensuring that no sectors are modified. This means that even the smallest change results in several sectors being written as both the sector holding data and its corresponding linked list have to be updated. So WORM disks are best used for file and forget systems. The ReWritable discs often operate slower but are better suited to changing production environments where disk's history tracking is not a priority. Corel cpk and IBM CRL2 CRL3 systems often managed the Disk's WORM filesystem. P201, P470C, P940C, P942, P1400C, P1402, P1002E, P1500E. Plasmon Motheye, WORM and Rewriteable discs were made, but no longer being produced. 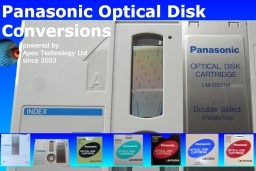 Plasmon and Panasonic had a close association in the development of WORM disks, juke box optical disk storage units. 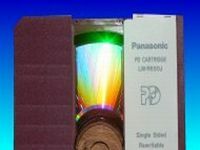 Plasmon's discs can be read in Plasmon and Panasonic Optical Drives. Plasmon was a UK supplier so a large number of their disks were sold in the UK, rather than under the Panasonic branding. Plasmon developed the so-called moth-eye disks which we can read and copy the data from to Hard drives, CD, DVD, USB and network attached NAS drives. The optical disks were used in Plasmon RF jukebox disk libraries, and also for Corel WORM filesystems. We have reverse engineered the filesystem so can extract the data from these Plasmon discs so you can transfer data to more modern systems for archive and easy access without the need of optical disk drives and SCSI hardware. Just contact us if your data is held in some unknown filesystem, electronic document management system, document scanner imaging workstation as we can reverse engineer most systems for the purpose of interoperability. LM-R650J LM-R650E PD650 by Panasonic, Imation, 3M, Teac, Mitsubishi, Plasmon. A disk that is frequently categorised as a DVD-RAM or MO disk, however it is different since they were recorded using Phasewriter Phase Change Dual. They were produced by Panasonic and 3M Imation during the early 1990's as a pre-cursor to the DVD-RAM. They were not widely popular and were only in production for a short time. Macintosh used a CD­ROM caddy cartridge to allow normal CD disks to be read in a PD Drive. However a CD drive could not read a PD650 disk. 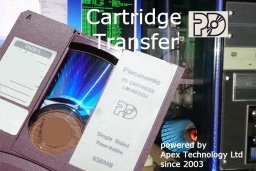 We can transfer data files from the Panasonic PD Cartridge Cartouche LM-R650J, 3M PD 650 and LM-R650E Single Sided Rewritable 650MB optical disks to say a regular CD for use in a Windows PC Computer or Apple Mac. See our CD DVD DVD-RAM recovery and file data transfer section. Part Numbers OC-900 WORM and Rewriteable discs. Typical requests for reading optical disks and transferring files are given below. Adaptec, Corel and Optisys was installed on the desktop that was used to write onto optical disks. MS-DOS mode was used to format and write onto the optical disk and read the data under Windows NT, 95, 98. I have some Optical discs that have older data we want to reanalyze. I have the optical drive (panasonic 7300) that was originally used to write the data. There are optical disks with panasonic lf-5010 drive - I need help in getting this drive back up and running. Click for Optical Disk Transfer & Data Recovery News. Click for Optical Disk Transfer & Data Recovery Reviews. When we read the disk, we make what is called a "disk image" or "dd" file - which is a "bit by bit" copy of all the RAW data on the disk. This includes ALL areas of the disk, not just the area occupied by files. We use this to extract the files, but also it makes an excellent archive copy of a disk which is useful for data recovery purposes as it includes areas where deleted files may still reside. We save a copy of the disk images to your USB and DVD. You don't need to concern yourself with them - they just exist for completeness of the job and archive purposes. In cases where we cannot crack the filesystem, the disk image basically is easily stored and sent to other companies for filesystem analysis. They no longer need the hardware Optical drive to examine the data. When we do similar work we always send the client a disk image as well as the extracted files. What is a WORM Optical Disk? Panasonic and Plasmon make WORM disk. This is a disk that can only have each sector written to one time. WORM stands for Write Once Read Many. The advantages is that for archive purposes, it is useful to have a disk that can't be overwritten. This is particularly required where disk store legal evidence, company accounts, scanned documents, receipts, billing systems, tax systems. However WORM disks are not suited to all environments. In particular they are quickly filled up in applications that read write and delete files regularly like many none archive system like a word processor. The WORM nature is achieved by assigning new sectors on the disk to accommodate changes to the data as time goes on. It then uses a linked list to piece together the most current sectors allocated to a file. So for instance if you were re-editing a word document or excel spreadsheet, then every change would be allocated a new sector. In this way even a small regular change to one document will start to fill up the whole disk, and when full, they often appear corrupt to the reading system, and then won't mount properly, depending on how good a job the WORM management software had been doing. An advantage of the WORM system is that if the software keeps track / history of changes. Depending on the WORM disk driver software management system you can roll back the state of the disk to when it was first used, so you can see changes to documents over time, and the file's history is preserved as evidence. Therefore the disk can be read backwards in time and data recovered from any point in time of the disks history. 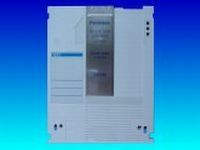 Back in the 1990s we found that all Optical disks storage systems are created equal - until you come to the world of Panasonic (Matsushita Electronics/ Matshita). Typical of this time, each computer vendor was trying to become the Standard and enjoy customer's locked into their eco-system by using proprietary filesystems, and encryption. As no data recovery engineer has ever said ... especially when dealing with old hardware, "The great thing about Standards is that there are so many of them". From a brief glance they look like standard Magneto Optical disks, however they are slightly thinner with different notches and holes in the case which are used by the optical drive to identify the disks. Plasmon Disk Jukebox Library Auto-Changer models. Panasonic Disk Jukebox Library Auto-Changer models. 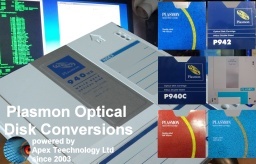 Panasonic & Plasmon Optical Disks Transfer, Conversion and Data Recovery problems that we recover data from are listed below. 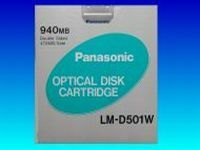 panasonic,plasmon,optical disk,optical disk cartridge,pd cartridge,disc,magstore,storage dimensions,reflection systems,ibm,3363,worm,jukebox,rewritable,library. Optical Disk Cartridge file transfer,conversions,data recovery. Panasonic,Plasmon,PD Cartridge,IBM,Disk Library,auto-changer,jukebox,WORM,Write Once,Corel.